Kade Bahari - What's going on in Mr. Solarz' Class? This is a story about a 3 year old girl and all of the thing and obsticles she encounters. We had to Breath through a straw and it seemed to get harder each time but I got more breathes each try. This didn't really make sense to me but that is what happened. With the thick straw we did it for a minute and the small straw for 20 seconds and then multiplied that by 3 to get balanced answer. Were some of the activities more difficult to do while breathing through the wide straw? If so which ones? I think the one where we were running in place. It hurt the most but I got more done. I felt light headed when I was breathing through the thick straw and running in place. 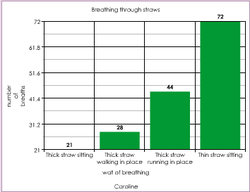 Why do you think breathing through the thick straw caused the effects you described? I think that I was able to get more done with the think straw because it alluded more air to get in then the other straw. I think that I got more breaths while running in place because I was breathing more heavily than while sitting or walking. Did breathing through the thin straw affect you differently than breathing through the wide straw? If so explain what happened. I was able to get more breaths with the thin straw probably because I was breathing faster. Why do you think you were asked to breath through the thin straw for 20 seconds? Why do you think that you were not asked to run or walk in place while breathing through the thin straw? I think it was to make sure that no one fainted or some thing like that because there would not be enough air for us to breath. How does your breathing change as you become more active? Why do these changes happen? I think that when you exercise you start to breath heavier and faster. It happens because you are getting ride of the oxygen in your body so you are trying to get more oxygen. I got my medical degree at Northwestern in Chicago. I can help the other group members fell better and I can help figure out what is wrong with them. I thought it would be a great opportunity to make a difference and help other people. I also thought it was something that may never be asked of anyone ever again. I figured way turn down something as amazing as this.